Confederation Freezers’ rich history in temperature-controlled warehousing & cold storage services encompasses all your temperature requirements including ambient, cool and frozen set temperatures. 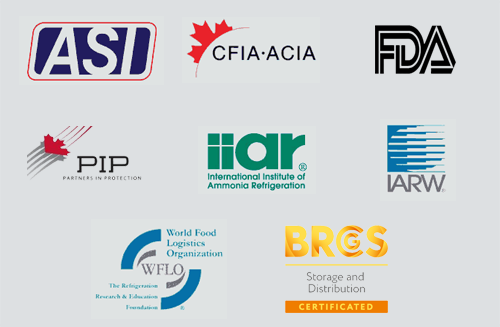 Add to that our transportation network, communications expertise and technical resources and you have a cold chain supplier you can rely on for Canada-wide service. Brothers Phillip and Harry Greenspan recognized the need for premium cold storage space in the Toronto (GTA) area and teamed up to create Confederation Freezers in 1974. Today, over 40 years, later Phillip’s son Alan, along with Harry’s son John and grandson Kyle, continue the family legacy and have expanded the company’s services and capacity to significantly shape and grow the business. Rapid freezing ensures the product is frozen to its core, maintaining freshness until the product is ready for transport and usage. Modern, state-of-the-art cooling facilities to the specific needs of our customers. Superior controlled warming to minimize the loss of moisture associated with natural warming.